We think of the fall and winter season as the home for big dramas and a few holiday blockbusters. But comedy has its place in the colder months, too! it’s easy to stay warm when you’re laughing your face off. We’ve got three very different comedies either in theaters now or coming within weeks — here’s the funny stuff coming in the last weeks of 2018. 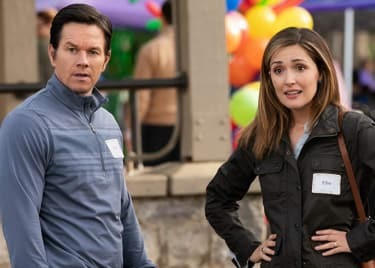 We’ve seen Mark Wahlberg playing over-the-top heroes for years, but INSTANT FAMILY brings him back down to Earth. He and Rose Byrne play a couple who decide to start a family, and because they’re older than most new parents, adopting a slightly older child is appealing. Then they go all the way, and adopt confident teen Lizzy (Isabela Moner), and her two younger siblings, Lita (Julianna Gamiz) and Juan (Gustavo Quiroz). Jennifer Lopez is back on the big screen in a good-natured comedy about ambition second chances. J-Lo plays Maya, who is frustrated by her inability to advance at the big box store where she’s worked for years. Guys with business school degrees get promoted over her, despite the fact that she knows her work inside and out. 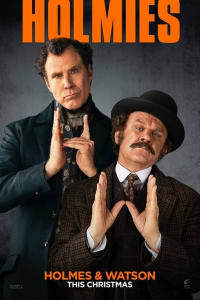 As soon as you say it — Will Ferrell and John C. Reilly play Sherlock Holmes and Dr. Watson — the idea sounds so perfect. How has this not happened yet? But here we are with a new comedy take on the greatest detective of all time, featuring the stars of TALLADEGA NIGHTS and STEP BROTHERS as a slightly less capable version of the crime-solving duo.